Chrome detail on my husband's dobro guitar (resonator), aka: "The Biscuit." Very nice, especially the way you've arrange the lighting to be symmetrical, too. A very slight niggle: you've cut off the edge of the plate-thingy on the left. If this is a crop, I'd put that back. But it's still a very nice shot. Good shot. Like the simple duochrome. nice shot, but it come across a little dull - what would have happened if you had increased the satuartion a little to bring out the green and contrast against the white? Amazing! 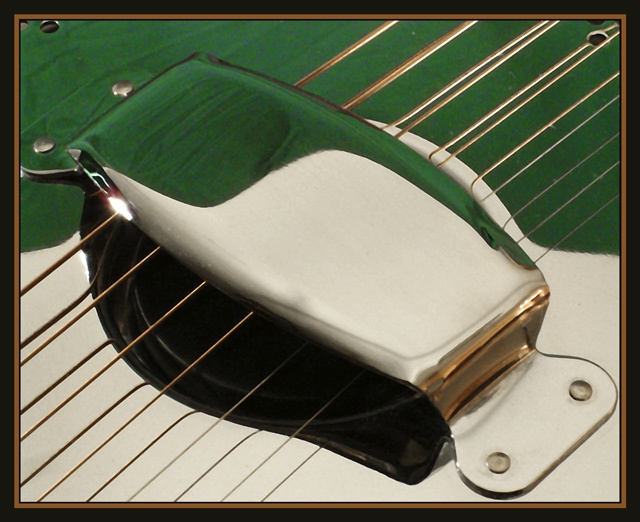 I love the balance between the colors, the reflections of the strings in the surface of the guitar. Well done. Very interresting take on the topic and very well done. Proudly hosted by Sargasso Networks. Current Server Time: 04/23/2019 01:59:08 AM EDT.